Over the next few months I’ll be taking the time to review some of the books, articles and research facilities which I have found useful during the decade-long process of researching and writing Richmond Unchained. 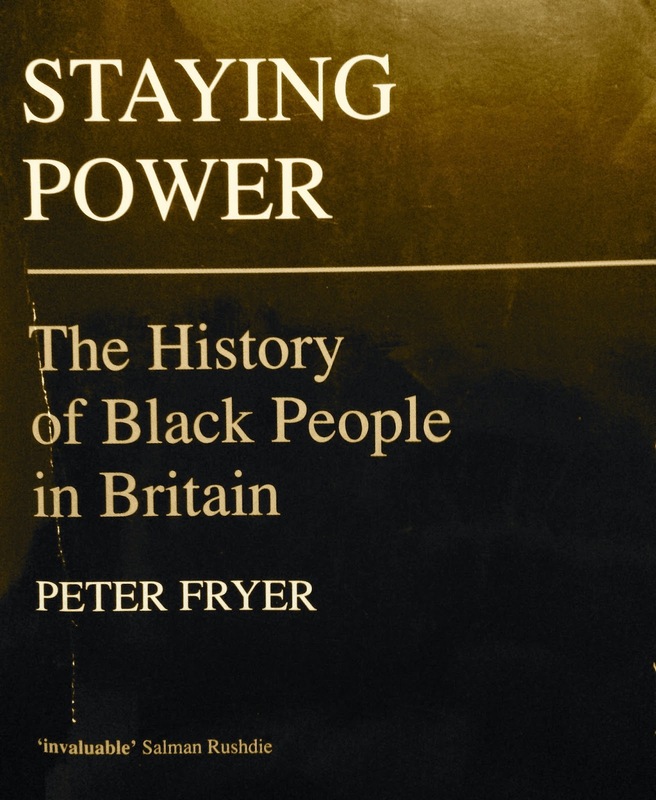 This series begins with my thoughts on Peter Fryer’s Staying Power: The History of Black People in Britain. Quite simply, any writer, historian or reader with an interest in ‘black history’ needs to own a copy of this book. Since its publication in 1984 Fryer’s near masterpiece has become the standard text on black British history, and it remains a model of concision, elegance and historical analysis. Many would argue that ‘black history’ is still a neglected area of study, both within academic circles and also within the mainstream, however when this book first appeared the paucity of books on the subject was even more pronounced than it is today. Nevertheless, although many worthy books have appeared since examining the hitherto shamefully hidden and neglected histories of ‘minority’ groups in Britain, it remains disappointing that no ‘overview’ of black British history since Fryer’s work has come close to matching its comprehensive sweep. (As an aside, the edition I own of the book is the sixth impression from 1992 and I’d be interested to know if the book has been updated at all since then or, indeed, since Fryer’s death in 2006 – I suspect not, which is a shame as it certainly warrants regular updating, even though Fryer is sadly not alive to perform the task himself). Fryer himself was a fascinating figure. Born in Hull in 1927, he later became a Communist Party member and wrote for the Yorkshire Post and Daily Worker. However he was apparently expelled from the party after dissatisfaction was expressed with his accounts of the 1956 Hungarian uprising and its suppression by the Soviets – events which Fryer, to his credit, condemned having observed them first-hand. While working as a journalist, Fryer had also witnessed the arrival of the MV Empire Windrush in England in 1948, an ocean liner which brought with it many West Indian immigrants. This event ignited in him an interest in black British history, which he researched for many years before writing Staying Power. Despite Fryer’s Marxist / Communist leanings, the book never veers into didacticism and retains a simplicity of approach which is refreshing. It is at once academically rigorous and also accessible. Fryer’s own political sympathies are clear, and naturally influence his viewpoints but, to this reader at least, they are logically and reasonably outlined, without needless rhetorical flourishes that lesser writers might rely on to paper over gaps in their arguments or research. The book is all the more convincing as a result; for example, Fryer’s analysis of the link between slavery and the development of the British economy is extremely well explained. During the first two or three months when I was researching Bill Richmond’s life (way back in 2003) I devoured Fryer’s book in about two days. I found it hugely valuable in enabling someone such as myself with a decent grasp of ‘black history’ - albeit one lacking in detail and refinement - to understand the social and cultural context of the times in which Bill Richmond lived, as well as the times which preceded and followed him. 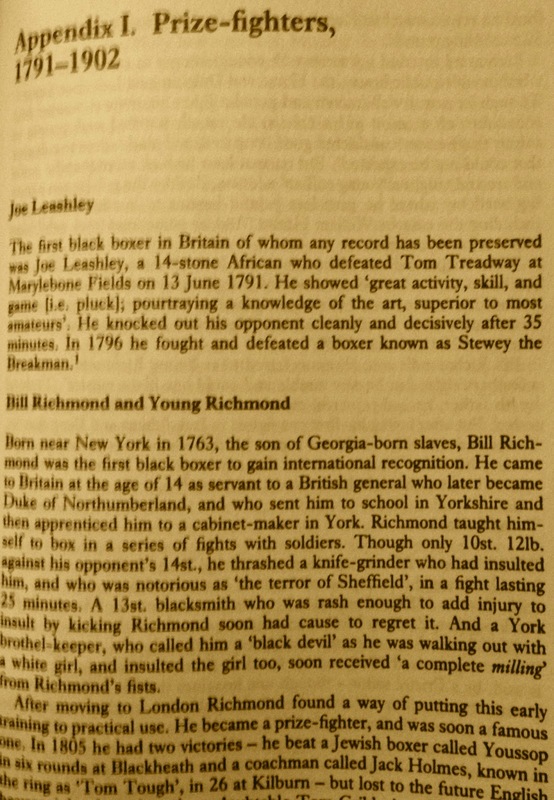 For example, references within Fryer’s book to Malachy Postlethwayt and Ukawsaw Gronniosaw opened up fruitful research avenues for me that have found their way, in one form or another, into the texture of Richmond Unchained, particularly the chapter where I take a brief detour myself into the history of black people’s presence in Britain. Amid my otherwise fulsome praise, though, I do have one caveat. I described the book earlier as a ‘near masterpiece’ and I use this phrase deliberately so, for the simple reason that I found Fryer’s work on Bill Richmond himself, and his protégé Tom Molineaux, somewhat sloppy and over-reliant on second-hand rather than primary sources. Several of the ‘facts’ Fryer recounts about Richmond are, to be blunt, not accurate, or at any rate cannot be proved correct beyond reasonable doubt based on existing sources or the sources which Fryer cites. To give one such example, Fryer states that Richmond’s parents were “Georgia-born slaves”, which has never actually been proven. He also accepts too readily (and over-relies on) Pierce Egan’s accounts of Richmond’s boxing career, with seemingly no consideration for the dramatic licence Egan may have employed, or the errors he may have made. Other factual errors also creep in; for example, Fryer states that Richmond fought Jack Carter in 1808 – which is incorrect. In common with many other writers, Fryer also claims that it was Richmond’s wife’s wealth that enabled him to come landlord of the Horse and Dolphin pub – a myth that I believe I pretty definitively debunk in Richmond Unchained. Fryer also makes a major error of omission by not mentioning Richmond’s role at George IV’s coronation celebrations, which it seems to me are a crucial symbol for the lofty status he managed to achieve – through boxing – within Georgian society. Perhaps, given that his accounts of Richmond and Molineaux’s lives appear in an appendix, rather than the main body of his narrative, Fryer did not feel the need to research them as meticulously as the rest of the book. This is a rare miscalculation on his part, as is his decision to relegate these two crucial historical figures to an appendix in the first place, rather than the book’s main narrative, where they really belong. I could go on in terms of the shortcomings of Fryer’s accounts of Richmond and Molineaux’s careers, but it would probably be churlish to do so; especially when, in the final analysis, Staying Power is a work of rare integrity and significance as well as lasting historical value.